Cheap Hot Tubs Under £2000 – What Are Your Options? Where do you head after a long day fighting a to-do list with too many items and not enough hours to complete them? A traffic jam on the way home? A family crying for some entertainment? An evening in front of the telly with the same old cycle of depressing news or re-runs? How about a change of pace? Why not trade in your daily routine for a long, relaxing soak in your very own inflatable hot tub, to ease away the cares of the day? On the weekend, how about catching up with family and friends over a cold drink in your very own blow up spa? Too expensive to install, you say? You don’t have enough room on your deck? Or, worse, you don’t own a deck? Not to worry. The pleasures and functionality of a hot tub can be yours without breaking the bank, even if you only have an indoor space. 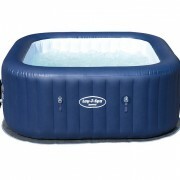 Portable inflatable hot tubs or spas for up to 8 persons can be yours in a variety of models to fit your budget, including options for indoor installation. The advantages of these portable units include easy assembly, a small footprint, and payment plans to make your dream of a home spa a reality. Let’s take a look at 5 models that showcase the best in portable home spas, for way less than £2000. Before we get into the specifics of each model remember this warning for all home spas: All children must be under adult supervision and in water depth suitable for their height. 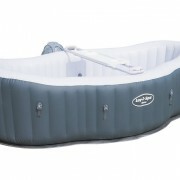 At a lower price point, this attractive tub features free shipping and delivery and a free Setup DVD and maintenance guide that solves the number one question users have about inflatable hot tubs: how do they work? Actually, installation is quite easy with many users claiming to have them ready to go in under ten minutes. 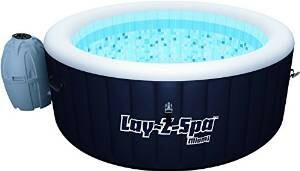 The Lay-Z-Spa Miami offers a rapid heating water system which reaches up to 40C (104F) and is timer controlled. This hot tub includes an all-surrounding Lay-Z-Massage Jet System to unwind those knotted muscles at the end of a hectic week. Included are two filter cartridges and a chemical floater. Users appreciate its durability, comfort and luxury at an outstanding price. The Miami is suitable for outdoor and indoor use and is available on a payment plan. Perhaps you’ve seen the Lay-Z-Spa Vegas model on TV and dreamed of having the same luxury, relaxation, comfort and portability in your own home? When you consider the value offered for this hot tub, you can ease into 40C water of this spa at the end of the work day and let the massage jets rejuvenate your overworked body, while you sip on a refreshing beverage. 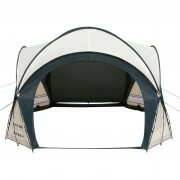 Suitable to enjoy with family or friends, it comfortably fits 4 to 6 people whether you set it up indoors or outdoors. Ease of use is one of its main features. You’ll have it ready to enjoy in minutes without special equipment or professional help. It comes with an attractive leatheroid cover with easy to fasten clips, an inflatable inner lid for excellent heat insulation to maintain constant water temperature. The Vegas hot tub spa includes digital controls for massage jets, water filtration and the rapid heating system, as well as a DVD set up and maintenance guide, filter cartridges (twin pack) and a chemical floater. It’s easy to imagine yourself in a desert resort in the Palm Springs spa. A blissful soak with 120 all-surrounding Air Jets massaging your tired muscles with heated water up to 40°C (104°F) is just the thing after a long, hard day. And while the Palm Springs hot tub, suitable for outdoor and indoor use, has an attractive price tag, it doesn’t skimp on solid construction or features. It offers 3-ply reinforced material to guarantee strength, durability, insulation and comfort for up to 6 persons. An added benefit is its 1 year warranty from date of purchase, leatheroid cover with inflatable lid and safety clips, plus an air pad floor mat for extra cushioning and insulation and a water filtration system to help keep your water clear. Is it your dream to feel pampered at the end of the day? 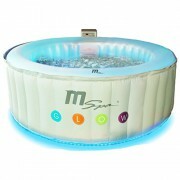 Then allow 120 heated bubble jets relax you as you soak in water you regulate with the touch of a button. 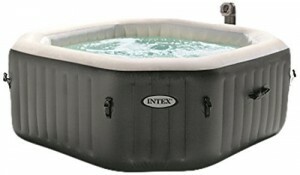 Intex’s unique patented Fiber-TechTM construction surrounds you with thousands of therapeutic bubbles to give you an inflatable home spa experience like no other. Among the Intex model’s unique features is a built-in hard water treatment system that is kind to your skin, your clothing and the internal mechanism. Owners give high marks to the easy-to-use control panel that allows you to regulate the force of the jets for your massage as well as the ability to adjust the temperature of the water with a simple control. Maintenance is easy and the spa performs well indoors and outdoors to give up to 4 adults a pleasurable spa experience every time. What does it take to have your own little slice of heaven? 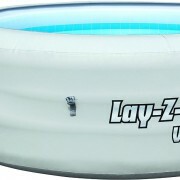 An air pump, a water hose and the Lay-Z-Spa Monaco. This inflatable portable model is the largest in our sample, fitting 6-8 comfortably for a weekend party with room to spare. A luxurious set of 86 air jets and rapid heating system that takes tapwater up to 40°C (104°F) gives you the feel of a traditional built in spa at half the cost. The Monaco model offers strong, solid construction, durability with a compact, rigid design that allows a total capacity of 1540L of water for greater comfort for you and your guests. The Monaco also offers a leatheroid cover and clips for greater insulation and to help keep it debris free. The package also includes a free DVD to explain the setup and maintenance of the unit, a spare filter cartridge and a chemical floater for the chlorine tablets that sanitize the water.